Ridiculous weather changes have disrupted my style lately. It’s chilly outside when I wake up, it’s freezing in my office, and it’s super hot when I head home in the afternoon. So, I’m embracing the weather outside by wearing my new red cropped pants lots before it’s too cold. I’m dealing with the temperature inside by wearing comfy jackets and scarves. Recently, I was browsing a couple of my favorite blogs and this outfit (to the right) caught my eye. I love the way that she paired a turquoise necklace with the black and white striped shirt, black cardigan, and red jeans. The turquoise is just a light touch of another coloring so it’s not too overpowering. In my outfit, the turquoise sunglasses are a terrible match but my favorite color is teal and I never know where to look when I’m taking these style photos. In the above photo, I was mostly avoiding the fact that a spider was about to crawl on my camera, which only made me think about how reading this will totally freak out my sister. After checking out the picture I decided that it was necessary to ditch one of the accessories. Yes, this outfit would be better suited for only one accessory. So scarf or sunglasses? Scarf! I’ll just have to save the sunglasses to pair with the red jeans another day. I love the possibilities of these pants! 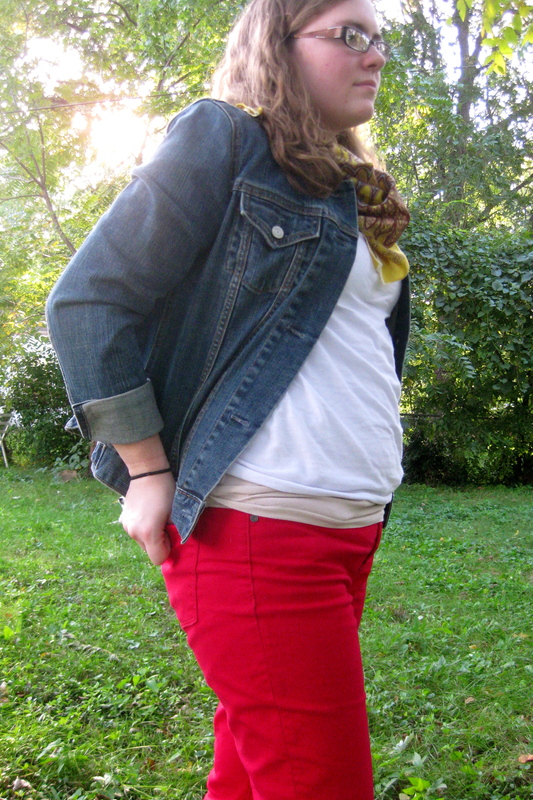 I’m having a blast dressing these red jeans up. I never realized how versatile a bright red piece of clothing could be. I feel like a little kid that just learned how to match colors and clothes. I wear these jeans so proudly. See you tomorrow Down Shannon Lane! 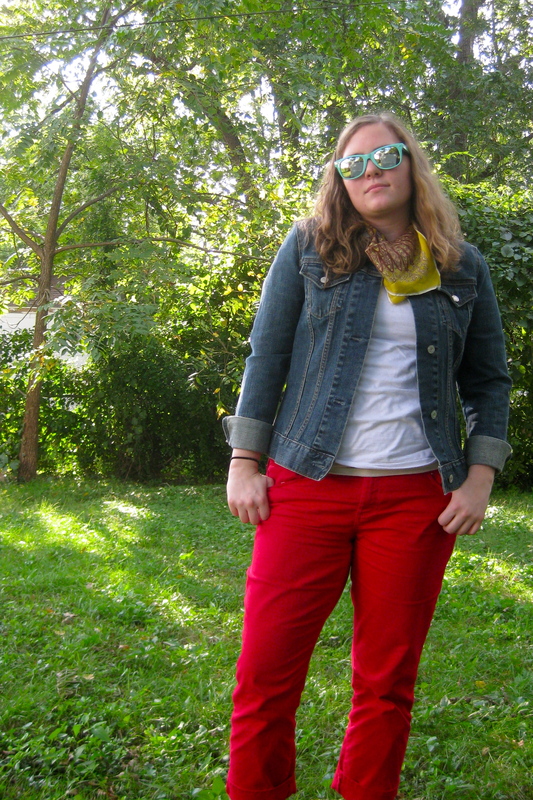 This entry was posted in My Life, My style and tagged black and white striped shirt, bright colored outfit, clothing, colored jeans, dressing down, fashion, hanes t shirt, jean jacket, red jeans, red pants, shannon lane, style, style blog, teal sunglasses, weather changes by Shannon Hruska. Bookmark the permalink. Oh my gosh. This is EXACTLY what I’m dealing with right now – cold in the morning, freezing in the office, hot when I leave. Glad I’m not the only one. 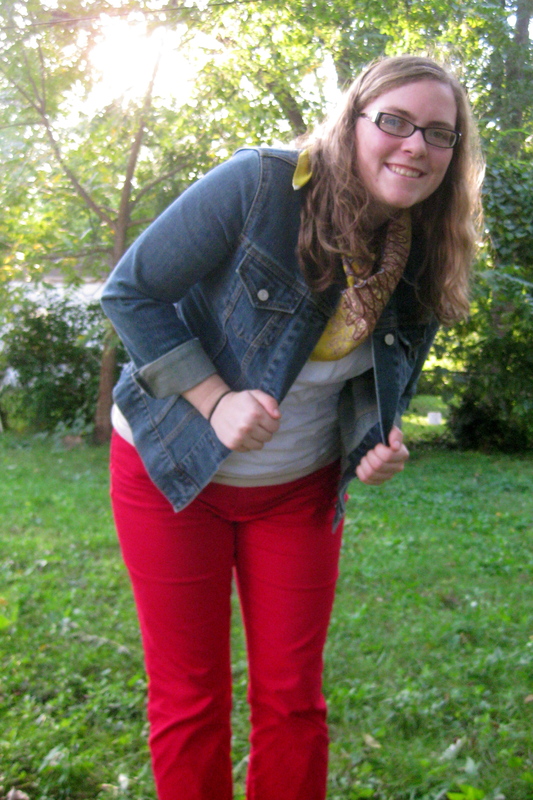 This outfit is almost the exact opposite of mine today — bright blue pants, white shirt, red cardigan. Love this though. haha. I am definitely glad that I’m not the only one. Luckily I love layers so jackets and cardigans are perfect until it’s warm. Thanks for the compliment! Your outfit sounds amazing.